Peridot is one of my favorite stones to design with because most people are used to seeing the dull and yellowish peridot. When they see the quality of the clear and vibrant green gem peridots I use it surprises them–they then develop an appreciation for the color. 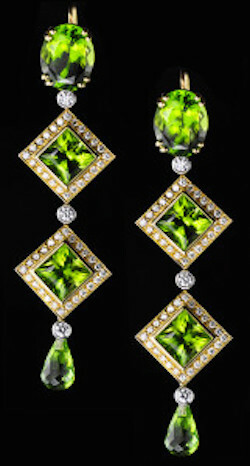 I designed these earrings with three precision cut square peridots and a peridot briollette. The peridots are from Africa and they were cut in Idar-Oberstein, Germany; the best gem cutters in the world. I used VS, E-F, ideal cut quality diamonds and set them in 18k hand-fabricated gold. The quality of the beautiful ingredients resulted in this magnificent pair of earrings–which made a certain girl very, very happy for her birthday!